Supaflu chimney liners offer many benefits including: improved structural stability, ease of maintenance, and suitability to all fuel types, but most importantly improved efficiency and added safety. Supaflu is designed to insulate your chimney while providing an effective barrier between the flue gases and your living quarters. Because of its liquid consistency, Supaflu seals all cracks and pores, greatly reducing the chance of your exposure to toxic gases. As an insulator, Supaflu is superior. In fact the R-value is 500% greater than clay tile liners. This insulation ensures that flue gases remain hotter and more buoyant, thus improving overall venting efficiency and reducing buildup within the flue. Additionally, your chimneys exterior surface temperature will be lowered, reducing the chance combustible materials surrounding your chimney may ignite. Supaflu is non-corrosive and is free of asbestos. Also, when subjected to alternate freeze-thaw cycles, Supaflu showed no signs of surface degradation. Specific Heat is the amount of heat required to raise the temperature of 1 pound of material by 1° Fahrenheit. For example, the specific heat of water is 1 btu/lb. F.
The Product-Unit Weight when multiplied by the specific heat represents the amount of heat required to raise the temperature of 1 ft³ of material by 1°F. The lower value the less time it takes to warm up or to cool down. For a flue lining material, a lower value is desirable so that when the ap­pliances attached to the flue start firing, the flue walls heat up more quickly thus reaching their working temperature faster. This effect will reduce condensation and creosote build-up during a cold start and provide an effective draft more quickly. Thermal Conductivity (also known as k-factor) determines the rate at which heat loss occurs through the material. 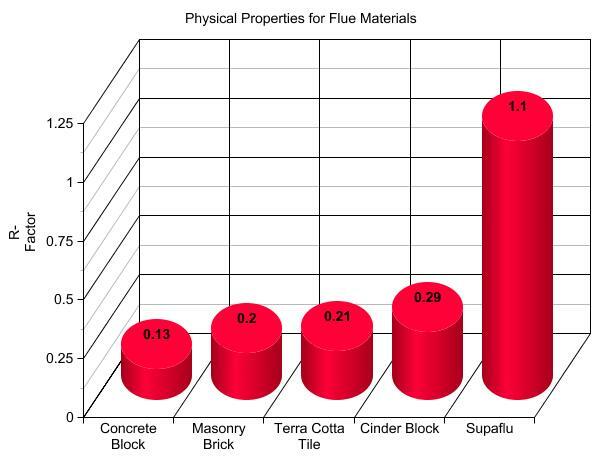 For a chimney flue liner, the value of thermal conduc­tivity should be low so that most of the heat of the flue gases is contained within the flue and only a small amount of heat loss occurs through the flue walls. Thermal Resistivity (also known as the R-factor) is the reciprocal of thermal conductivity. Therefore, we would look for a high value for a chimney flue. 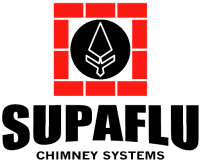 Listed below are commonly requested informational documents for the Supaflu Chimney Lining System.